Several of the 11 owl species that inhabit most parts of Idaho and the region are already well into their courtship and production of a new generation, according to Jim Lukens of the Idaho Fish and Game Department. They get the early start so the hatching of owlets will coincide with peak prey abundance in spring. That gives owlets a long summer to become skillful, self-sufficient hunters, he said. Great horned owls revved up their season of love as early as December, when it’s not uncommon around the wooded edges of Spokane to hear great horned owls hooting before dawn or after sunset. The hoot of the female great horned is higher pitched than the male’s even though the females are up to a third larger. Pair duets are usually heard prior to egg laying, often in the immediate vicinity of a chosen nest. What they say to each other is still a mystery. “Great horned owls have a wide repertoire of calls, including squawks, chitters and barks, whose meanings are still poorly understood,” Lukens said. Western screech owls also are early nesters. These small woodland owls have distinct eartufts. Pairs use two song types: the “bouncing ball” song – used for territorial advertisement, and the “double trill” song – used as a contact call between the male and female, Lukens said. Again, the female’s voice is higher pitched. Northern saw-whet owls, small, short-bodied owls with enormous eyes, make occasional forays into the valleys where people are more likely to observe them. Named for their alarm call, which resembles the whetting of a saw with a file, the male’s advertising song is much different – a series of monotonous toots usually sung from a prospective nest hole. The female sometimes sings a softer version, Lukens said. 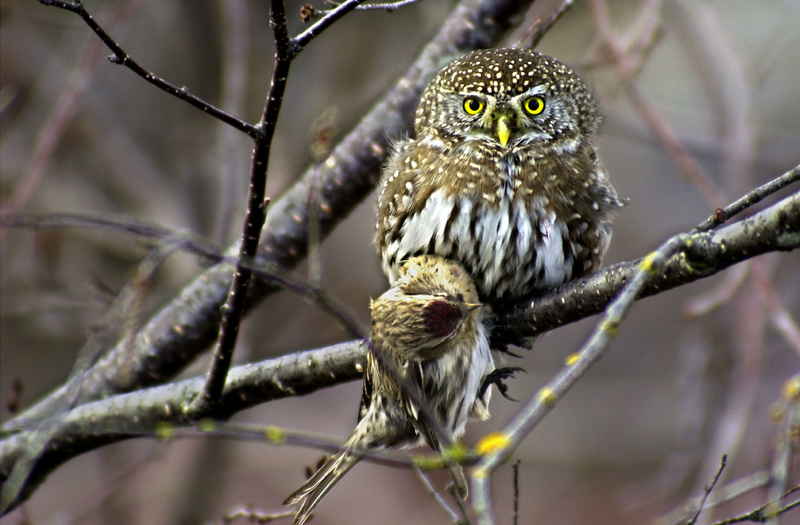 The northern pygmy owl is a tiny woodland owl of the Mountain West common around the Inland Northwest. It sings most frequently at sunrise and sunset, he said. The male’s common advertising call – or “toot” song – is a repetitive single note sung late February through June. “One of our rarest owls, the boreal owl, is a year-round resident of subalpine forests,” Lukens said. “This small owl nests in old woodpecker cavities. Males start singing as early as late January, with females joining in by early February. The great horned howl is the most accommodating of these owls in giving us a glimpse into their nurseries. Their large nests are fairly easy to spot in big trees including pines and cottonwoods. Soon we’ll be seeing the large gray gloves of their offsprings’ heads easing up above the nest level, another generation to make it a hoot to be in the woods.